The Supreme Court ruled the federal government could legalize gambling on a state-by-state basis. There has been a lot of discussion about states who wanted to legalize sports gambling. In addition, there are also sports franchises who have been looking at gambling as an opportunity rather than as a problem. The Dallas Mavericks appear to be one of those teams that are openly courting gambling. 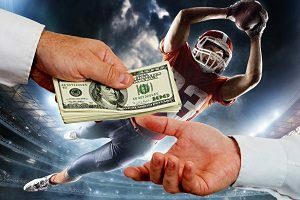 They recently hired a sports gambler to help them move towards developing sports gambling within their franchise. Americans have been betting on sports informally as long as there have been sports. However, the notion of gambling in sports has not been legal for some time across the country. This is an interesting paradox because Americans bet more on sports (illegally) than nearly any other country in the world. It is estimated that roughly $150 billion is spent by Americans on illegal sports gambling. Sports gambling has been illegal nationwide since 1992. The US government passed a law that declared single sports betting illegal except in Nevada, which was grandfathered in. Many people play fantasy sports, which generates millions of dollars in unpaid revenue. So, New Jersey sued the government to have the right to allow sports gaming at its casinos in Atlantic City. The case went to the Supreme Court, which agreed that states had the right to regulate their own gambling laws. The Dallas Mavericks have been a part of the National Basketball Association (NBA) since 1978. The Mavericks have proven to be a very popular team. They have sold out 704 consecutive games since 2001. They are the team a record holder of the longest-running sell out streak in the country. The Mavericks have won three division titles, two conference championships, and one NBA championship in 2011. Perhaps the greatest gift the team received was Mark Cuban. Cuban, an internet kingpin and season ticket holder worth nearly $4 billion, wanted to give the Mavericks recognition. He immediately set out to rebuild the team. He created gimmicks to lure fans in. He created millions of dollars of fines for himself; he angered many referees with his antics. However, his ownership of the Mavericks has turned the team around. They went from a team with a consistent losing record, to a team that is always in contention for a playoff spot. The Dallas Mavericks are successful. One reason is that Mark Cuban can look toward the future to new trends in the sport. Mark Cuban is predicting that the future of the sport will be in gambling on basketball, which means he wants his team to be prepared. Mark Cuban has recently hired Bob Voulgaris, who has been a successful sports gambler for many years. He has managed to make a career of successful sports gambling through research rather than “gut feelings.” He is known for utilizing data from many different sources as a way to predict game outcomes for NBA teams. Voulgaris has a huge following on Twitter, where he tweets information, data, and opinions on the NBA. Cuban hired Voulgaris to direct the research for the Mavericks. He wants Mavericks data and data across different teams for use by the Mavericks. It is expected Voulgaris will be able to speak to the Mavericks about analytics used in betting. He will also talk about expertise on coaching with an eye towards the future of gambling for the league.